Personal training for your dog and you! ​Do you need help teaching your companion good manners at home and out & about? 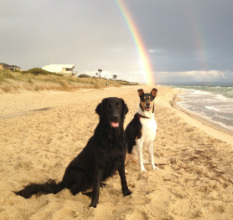 Would you like to be able to let your dog off the leash confidently and enjoy the many off leash beaches and parks Melbourne and surrounds have to offer? Sit at the cafe and soak in the sun with your dog by your side? Life is a beach with a well mannered dog. If you want a well mannered dog that is a pleasure to be with, then we have the course for you. Teach your dog polite manners in common situations such as around the dinner table, greeting a visitor, walking on leash and relaxing at a cafe. Along the way you will learn what it takes to successfully train your dog for real life, and how to reduce your need for food as a reward. The content of the sessions is fully customised to your specific needs. Foundation: from $450 for 4 private sessions. Advanced: from $450 for 4 private sessions. Confidence unleashed! 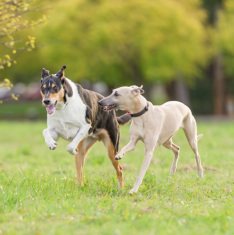 Learn how to train a really reliable recall, understand dog behaviour and keep your dog safe at the off leash park, and discover Melbourne's many beautiful off leash parks and beaches with your dog! From $450 for 4 private sessions. Walking on a loose lead is one of those essential skills for a happy life with your dog, yet very few people know how to teach their dog how to do it. Find out how to walk in harmony with your dog without the use of force or choke chains. From $350 for 3 private sessions. Interested in enrolling? Just complete the form below or contact us. Strong focus on real life training - at home, at the cafe, at the park. Free email and phone support for enrolled clients. Never miss a session! Flexible scheduling to fit into your busy life. Customised to your needs, your family, your home. Involve everyone in the family in training, including the kids. My dog journey started with Jessie, a small white fluffball bichon-schnauzer cross. She was trained the traditional way by choke collar and verbal praise. After she died, Giro, my Smooth Collie, taught me how wrong this approach was, and introduced me to the fascinating world of positive dog training. 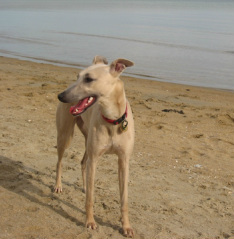 Kiara, my Whippet, reaped all the benefits, and can't wait for her training all day, every day! Stay in touch! Get training tips, great ideas for getting out and about with your dog around Melbourne, news and a real life blog from the positive dog training world on Facebook. ​For group training in other locations, please feel free to contact us. Melbourne NE/SE suburbs (see below). We come to you: we train in your home and local park. Serviced suburbs include Balwyn, Balwyn North, Blackburn, Blackburn North, Blackburn South, Box Hill, Box Hill North, Box Hill South, Briar Hill, Bulleen, Bundoora, Camberwell, Canterbury, Diamond Creek, Doncaster, Doncaster East, Donvale, Doreen, Eaglemont, Eltham, Forest Hill, Heathmont, Heidelberg, Hurstbridge, Greensborough, Ivanhoe, Kangaroo Ground, Kew, Kew East, Lower Plenty, Macleod, Mill Park, Mitcham, Mont Albert, Mont Albert North, Montmorency, Nunawading, Panton Hill, Park Orchards, Plenty, Research, Ringwood, Ringwood East, Ringwood North, Rosanna, Smiths Gully, Surrey Hills, Templestowe, Vermont, Vermont South, Viewbank, Warrandyte, Warranwood, Watsonia, Wattle Glen, Yallambie, Yarrambat. Travel charges may apply for travel to suburbs more than 15 km from Eltham.